Research on European governance is central to understanding both the process of European integration and its external influence as a laboratory for multilateralism. 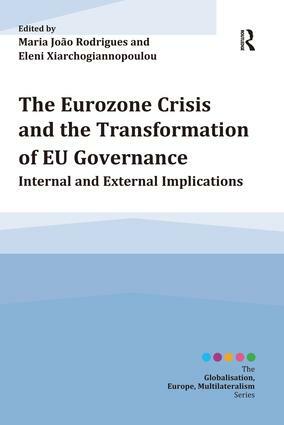 This volume focuses on the impact of the recent Eurozone crisis and its far-reaching implications for European governance both inside and outside the EU borders. Ideal for classroom use, this volume covers: I. European modes of governance: concepts, recent trends and international implications with chapters by Lefkofridi & Schmitter, Cini, Borrs and Radaelli. II. The transformation of European economic governance with contributions by Fabbrini, Stoffaës, Collignon, Eising, Rasch and Rozbicka. III. The transformation of European social policy governance with Goetschy, Hemerijck, de la Porte and Heins. IV. The international implications of the transformation of EU governance highlighted by Rodrigues, Xiarchogiannopoulou and Mügge. A Good or a Bad Crisis for the European Union? European Re-Regulation Meets Global Financial Governance: Constraint or Complement?